Good-looking, sweet and interesting. Although this doubles as our date wish list, we’re actually talking alfajores. Coco Karamel alfajores to be precise. If you’ve never had the pleasure of meeting one of these charming cookies, let us introduce you. But be warned – you’ll fall head over heels in love. Pronounced alfa-hor-es, these sweet snacks are staples in Argentina. Traveling by bus? They’ll hand out alfajores. Going to a party? 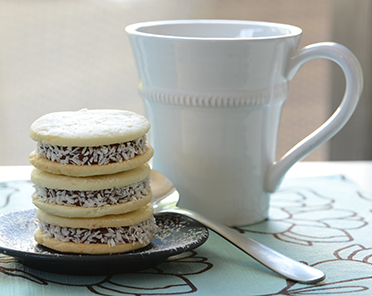 You’ll be served alfajores. Celebrating a milestone? You’ll get the gift of alfajores. “In Argentina, it’s crazy. 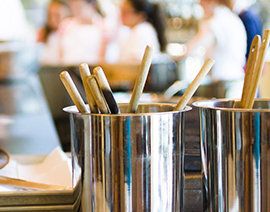 You go over there and people are eating Alfajores for breakfast, lunch and snack,” explains Sergio Lopez, co-owner of Coco Karamel. Sergio and his wife Marisa are both from the province of Buenos Aires, where Marisa learned to make Alfajores at an early age. “In Argentina, every woman knows how to make a traditional alfajor,” Marisa says with a goodhearted laugh, as if it’s the silliest question she’s heard all day. We’re in the sun-filled front room of the new Coco Karamel building in Calgary and I’m blitzing her with questions about the curious little cookies while Spanish music plays softly in the background. Sitting down at a dainty white table ornamented with pink flowers to have a cup of coffee and an alfajor, I see why they’re so popular. Each alfajor comes individually wrapped by hand and sealed with a sticker, which makes unwrapping your cookie feel like the start of a luxurious little break to the day. Once you bite into the soft but dense snack, the crumbly cookie melts in your mouth and the smooth filling lingers deliciously on your tongue. The traditional alfajor is made with two vanilla cookies protecting a creamy dulce de leche filling with a little bit of coconut rolled along the circumference, sticking to the sweet insides that bulge out slightly. For the uninitiated, dulce de leche is a sweet milk caramel that is very popular in South America. Coco Karamel also offers semi-sweet chocolate and white chocolate versions made with dulce de leche and chocolate cookies dipped in more chocolate, and a quince version made with vanilla cookies and fruit jam. Marisa makes the majority of the cookies by herself, getting help from family members now and then. 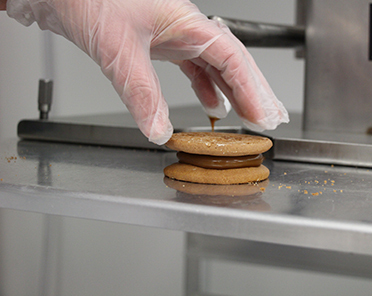 As she takes us into the production room to walk through the many steps of making an alfajor, her perpetual smile and eagerness to educate tell us she doesn’t mind all the hard work. The company has grown from its farmers’ market roots with a rolling pin and cookie cutter, but most of the process is still done by hand. And while the dulce de leche is imported from Argentina (it’s better there, insists both Marisa and Sergio), the rest of the ingredients are purchased locally whenever possible and contain no added preservatives. 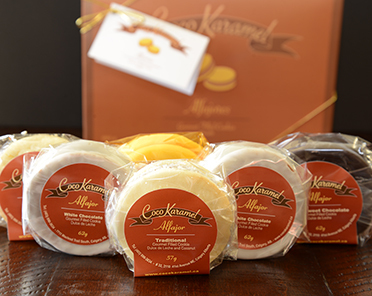 You can purchase Coco Karamel alfajores in all Calgary and Edmonton Sunterra Markets. For custom orders, visit cocokaramel.ca.